(at-sea installation), and MakaiPlan Pro Power (in-office simulation/training). 1. Cable Top Angle: MakaiLay now has the option to use the cable departure angle, or “Top Angle”, which can be measured at the over-boarding point. When high quality measurements of top tension are not available, using the Top Angle enables Makai’s real-time cable model to calculate cable shape, touchdown and tension more accurately during shallow water power cable installations. Makai has developed a new cable model that includes cable bending stiffness, which is now being used in two new tools: the Shape Calculator and the Heave Analysis tool. 2. Shape Calculator Tool: Allows the users to perform rapid static analyses of the cable shape under different lay conditions (currents, slopes, depths) to ensure bend radii and tensions are acceptable. 3. Heave Analysis Tool: Because power cables are laid with residual seabed tension, the cables’ bend radii and tension are sensitive to heave of the ship. 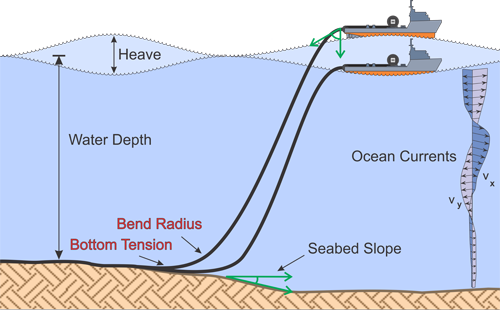 The Heave Analysis tool allows users to perform analyses for different sea states and lay conditions (see Figure 1) to ensure that tensions and bend radii are within allowable limits. The tool can be used in office to design a safe lay, or at-sea to make fast decisions about the lay as conditions change and contingencies arise. The core product, MakaiLay, accurately models the cable shape, bottom tension and touchdown location as it is installed on the seafloor. With a complete picture of cable conditions, operators can accurately control bottom tension and touchdown location, significantly reducing the time, cost, and risk of a lay. For power cable jobs in areas of transition from shallow to mid and deep-water, steep seabed slopes, and strong currents, it can become especially difficult to control the cable’s tension and bend radius at the seafloor, risking the safety of the cable. In these situations, MakaiLay’s cable control and navigation instructions become critical. The MakaiLay suite includes a route planning tool (MakaiPlan) and a simulating/training tool (MakaiPlan Pro), in addition to the real-time, at-sea tool for controlling cable deployment (MakaiLay). Power cable modules with a growing number of power-cable-specific features are available with each product. Click here to watch a brief video showing the software in action.